The holidays are all about indulgence: taking time off work, buying special gifts, throwing and attending parties, and treating ourselves to rich seasonal delights. 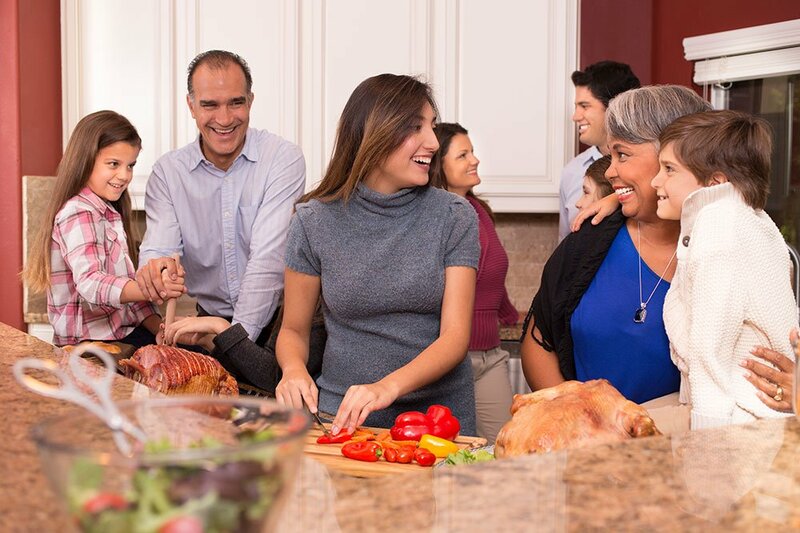 However, this time of the year can also present a challenge: how can you stay healthy over the holidays with so much good food (and so little time)? The right mindset and some scientifically sound advice can help you stay on track with your healthy diet and fitness goals. Here are a few tried-and-true steps you can take to prevent holiday weight gain and maintain your hard-earned fitness into the new year, while still partaking in the season’s festivities. Mindfulness is your most powerful weapon against overindulging. Focus on enjoying the foods you really love, and leave the items you find just “okay” for someone else. Before you spoon anything onto your plate, ask yourself, “do I really want this?” If the answer is yes, take a small portion—you can always go back for more if you are still hungry. If you’re indifferent, you can live without it. You cannot change what you ate at last night’s party; you do have control over what and how much you eat today. Don’t use one slip-up as a reason to abandon your healthy habits for the rest of the holidays. Be mindful of your ultimate goal to look and feel your best. Also, don’t skip meals before a big party in an attempt to “save calories” for the feast. Arriving at an event when you are overly hungry only sets you up to overeat and choose unhealthy foods you don’t really want or need. Instead, have a healthy, filling snack, such as unsweetened greek yoghurt with fresh berries and almonds, an hour before the party. Instead of looking at exercise as something you “should” fit in during the holidays, make it festive! Take the kids ice skating, sign up for your local Ugly Christmas Sweater 5K, or invite the cousins you rarely see to take a long walk—it’s a great way to catch up while getting some exercise. Make it a goal to get your family on their feet as often as possible. There are plenty of other healthy food swaps you can make to reduce sugar and fat, boost nutritional value, or make your holiday special-diet friendly. This ingredient replacement list offers some great ideas to help you get started. Staying properly hydrated should be a year-round habit to keep your body healthy, your skin glowing, and your energy levels up. Studies also indicate a likely link between adequate hydration and weight control. During the holidays, drinking plenty of water can stave off hunger, helping you resist the tray of cookies in the break room. If you need variety, unsweetened herbal tea counts too, but steer clear of sugary beverages or artificially sweetened drinks, which may actually sabotage your efforts to lose or maintain weight. It’s easy to use celebrating the season as an excuse to indulge on a daily basis in December. However, treats are called “treats” because they are reserved for special occasions. Keep food indulgences to only those days that are truly special to you or your family, such as Christmas Eve dinner, New Year’s brunch, or Aunt Sally’s annual cookie swap. Staying on track with your workout routine can be challenging around the holidays, with short daylight hours, chilly temperatures, and a busy travel schedule. If you’re having trouble getting to the gym for your usual hour each day, consider trying Tabata style workouts, which involve very intense bursts of activity alternating with rest intervals. Studies show Tabata style training effectively increases basal metabolic rate and anaerobic capacity with workouts lasting as little as 10 to 15 minutes. Here is a sample workout you can do anywhere with no special equipment (do get your doctor’s permission before starting any new exercise routine). Many holiday-themed drinks such as eggnog, gingerbread lattes, and spiced hot cider are packed with sugar (a grande peppermint white hot chocolate from Starbucks contains 86 grams of sugar—that’s 7 tablespoons!). Have one of these beverages each day for a month, and the pounds can creep on quickly. To indulge without all that sugar, try a plain dark roast coffee topped with whipped cream, a cup of cinnamon-apple herbal tea, or a plain small latte sprinkled with nutmeg. Alcohol has 7 calories per gram, with no nutritional value. Add in the fact that many holiday cocktails contain a lot of added sugar, and you’ve got a recipe for weight gain. Avoid the empty calories (and the hangover) by filling your wine glass halfway, and filling the rest with plain club soda. Another tried-and-true strategy: for every alcoholic beverage you enjoy, drink two full glasses of water in between. This will not only force you to pace yourself, but will also help you feel fuller, preventing unnecessary nibbling. There are many benefits to getting enough sleep each night: improved memory, reduced inflammation, and even younger-looking skin as you age. Adequate sleep is also thought to improve one’s ability to cope with stress (which may come in handy when visiting the in-laws). In addition, there is evidence linking insufficient sleep to weight gain—likely because we tend to be less active when we are tired and turn to food to make up the energy deficit. Instead of indulging in an extra slice of cake on Christmas, indulge in an afternoon nap. You simply cannot change what you ate at last night’s office party—but you do have control over what and how much you will eat today. So don’t use one slip-up as a reason to abandon your healthy lifestyle for the rest of the holidays—focus instead on making positive choices day to day. You can take heart knowing the average American only gains 1 pound between Thanksgiving and Christmas. Consistently eating wholesome foods and watching your portions the rest of the year is the key to maintaining a healthy weight. We hope you find these tips useful as you navigate the buffet tables, office break rooms, and cocktail bars this holiday season. And remember, if you need a little extra help looking your best, during the holidays or any time of year, consider talking to a board certified cosmetic surgeon in your area about your options. Happy holidays!